In the series, “Building a Business: Conversations with Entrepreneurs,” with Dr. Corinthia Price,CEO and Founder of Workforce Career Readiness™ shares the life-lessons of various leaders of how to build a start-up business from scratch. Conversations will be about a variety of different topics such as success, persistence, work-life balance, family, philanthropy, and anything else in between. Building a business is no easy task. Have you ever wondered how they do it? Shuffling between full-time jobs, family commitments, college/school, and everything else life throws your way. When it comes to starting and building a business, there are going to be challenges that you will encounter. As an entrepreneur, I've experienced the ups and downs of building a company and a brand. Starting a business is one of the most challenging and rewarding things I have ever experienced. 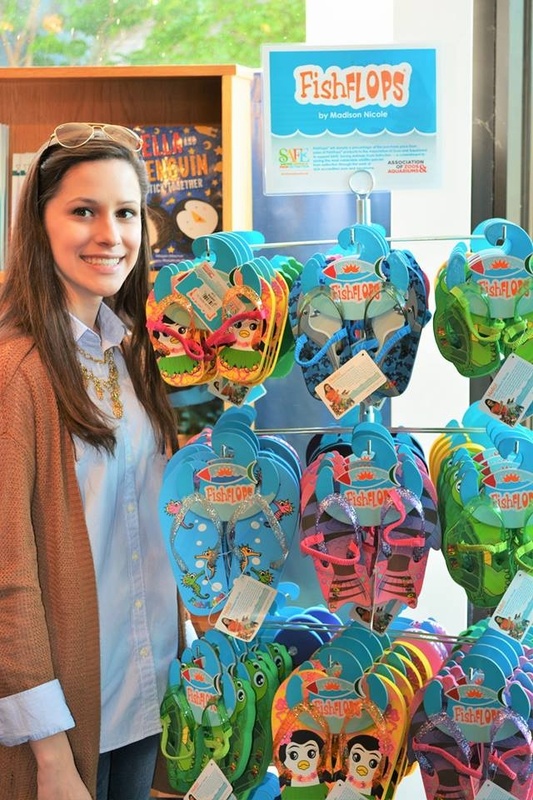 In this conversation series, Madison Nicole CEO and Founder of FishFlops® by Madison Nicole, shares her journey of juggling being a full-time college student while starting a business. She addresses the issues of starting and managing a successful footwear business, the importance of family, finding your happiness, and the skills entrepreneurs need today. What ignited the spark in you to start FishFlops®? I was born on Galveston Island, Texas and grew up loving the beach. My family took me fishing, swimming, and beach combing all the time. Since I loved to draw and color, in 2006 at the age of 8, I made an outline of a flip flop, my favorite shoes, and added the sea creatures I had drawn. I took the drawings to my dad and said, "Hey, look dad, FishFlops®!" I thought the name was "catchy" and so did my dad. He got excited and purchased the FishFlops.com domain name that day. However, the process of refining my product and bringing FishFlops® to market took several years. I learned patience and persistence. I have had opportunities to learn the business with the help of my dad. Growing a business has given me confidence in the classroom and among my peers. I've been able to share my story of persistence through public speaking events that I hope will inspire others. 1. Find balance between school academics, school activities, friends, family, and the business. My school activities and studies always come first but I spent some time each day working on the business. My family knows the importance of a good education and good friends that last a life time. 2. Time Management- I have developed time management skills that apply to my school work and activities, my business, and my family through working with the National Honor Society (NHS). NHS provides a road map to further develop one's personal skills. Attending NHS meetings on a regular basis is beneficial and kept me on track to strive for academic and business success. I have been traveling and attending meetings, charity events, and public appearances. My friends and family support me and my business. I always find time for them but sometimes I have to sacrifice fun for business. But then again, business can be fun too. 3. Being able to say no! You cannot please everyone. Walking on the beach and looking for different types of shells, going to Aquariums, shopping, and sharing thoughts and ideas with my grandmother. As a child, my mom would read me Goodnight Moon, by Margaret Wise. I would ask her to read it again and again. I loved the simple drawings, colors, and story. Being in college and having a business does not leave much time for hobbies, but I like spending time with my friends and family at the beach, on the golf course, and fashion and decorating. I am a determined entrepreneur and do not give up very easily. In business, the customers help you make that decision, so I listen to my customers. Seeing my family happy. Accepting challenges and successfully completing goals. Spending time with friends and family. Working with charity organizations is rewarding. I will never forget receiving pictures of young children in Uganda standing in line to receive a pair of FishFlops that would allow them to have shoes to attend school. The children that had already received their FishFlops in Uganda were holding them so tight to their bodies and smiling big! 1. Vision: Start with a concept that you believe in and that you get excited about. 2. Develop a Business Plan - Most of the time, you will have to make adjustments along the way. 3. Follow through and have good leadership qualities. 4. Being a good communicator and be willing to listen and learn from others. 5. To be an entrepreneur you must take the first step on your own, be patient, persistent, and to never give up. A big day for me was being interviewed in Nordstrom next to my shoes. However, the most satisfying moments are the letters of encouragement I receive from children around the world who ask for advice on how to start a business like FishFlops. "Principals of Marketing" is my favorite class in the Mays Business School at Texas A&M University. Creative Thinking (Vision), Communication, & Execution. The ability to learn and make adjustments is also essential. During the school year, I work a few hours per day. However, most of my work time is spent on the weekends. In the summer months, I can work more. Being a young entrepreneur pushed me out of my comfort zone and I was challenged to become a more efficient communicator. Speaking at a Junior Achievement event the first time in an auditorium filled with 5,000 students was challenging for me. This experience helped prepare me for leadership roles in other areas of my life. My support system! My parents, grandparents, mentors and industry advisors. During high school, at times I had to sacrifice performing with my dance team to go on a business trip. On many weekends while friends were getting together, I was working on my business. My parents encouraged me to find a balance between the two. What is challenging about having a business at a young age? The basic challenge is making decisions about traveling to business meetings and getting guidance and support from my parents and school administrators.